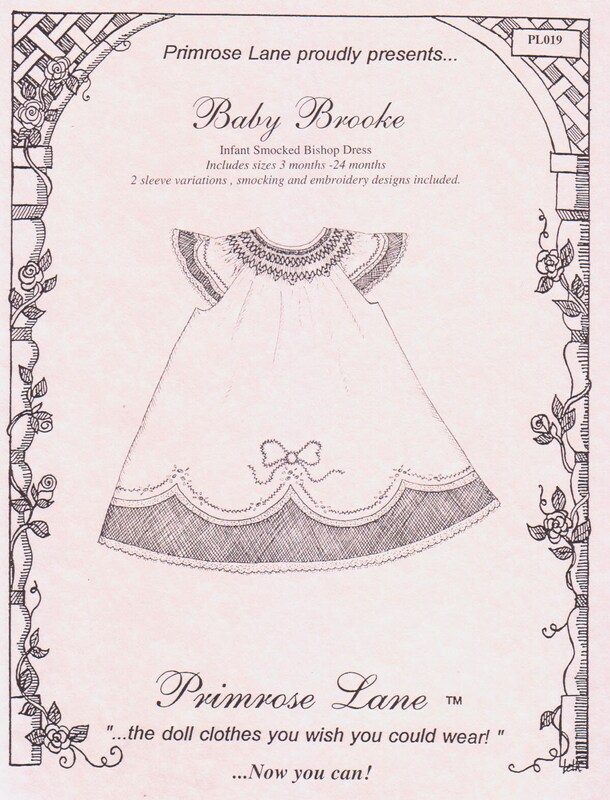 Baby Brooke is an elegant smocked bishop dress with puffed or angel sleeves. It is designed to be embellished with simple hand embroidery, lace insertion and edging at the sleeves and the hemline In addition, a contrast fabric is used below the lace insertion to create a truly unique dress. Complete illustrated instructions are included in the pattern. Additional variations are described in our exclusive Designer Pages and include "Country Girl" simplicity itself using calico and blanket stitch embellishment: "Summer picnic" - any gingham, mini rickrack and eyelet edging make a quick summer dress: and Pure Elegance" - an elegant variation that uses wide Swiss embroidered edging instead of the contrasting fabric. Baby Brooke can be dressed up or down as you desire making it a very versatile pattern. Exactly as described and easy to use pattern.